The deluxe version of our Farmstead Basket. From our orchards, the sweet Imperial Comic pears; from the hillside dairies of California, the artisan cheeses; from a little bakery in Madera, the baklava - we could go on, but you get the sweet picture. 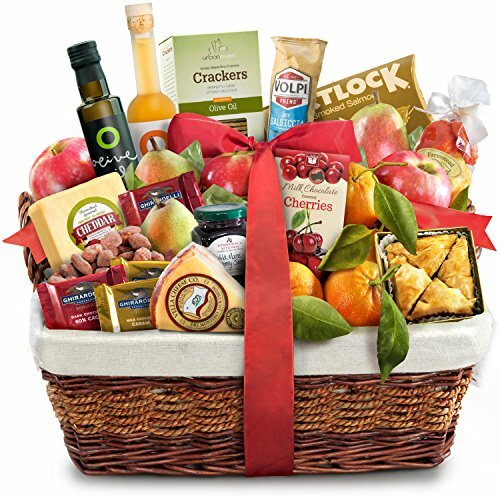 This deluxe sized gift basket is loaded with California's seasonal finest making it an ideal choice for gift giving. A beautiful trio of juicy Comic pears from our own orchards (Anjou pears when Comic are not in season), petite mandarins, and crisp Brae burn apples. Two northern California artisan cheeses, olive oil crackers, dry salami, smoked salmon and many more savories. Rounded off with rich chocolates, dried fruits, baklava and sweet cinnamon almonds, balsamic and much more.